Sister Bernadeta was born on December 24, 1928 and baptized Bona Genova Bodushka. Her father Geno Bodushki came from Sekirovo (now part of the town of Rakovski) and her mother Ana Bodushka came from General Nikolaevo (at present part of the town of Rakovski) One of four children, Bona opened her heart for our Lord when she was ten. One of her sisters gave her a rosary as a present. The young girl new the prayers and prayed regularly. When she once visited her aunt, she met Teresa Pashkova who was a Carmelite nun. Sr. Bernadeta still clearly remembers that encounter: Teresa in her black dress sitting next to the stove telling them how the sisters had been sent home because of the bombings in Sofia. After that Bona’s desire to live as a Carmelite became stronger. But in order be accepted by the Carmelites, she had to have an allowance of 60 000 Lv. Her uncle accompanied her to his Excellency bishop Ivan Romanov. The bishop was willing to give her 30 000 Lv but she was not able to provide the rest of the money so her parents did not allow her to join the Carmelites. They decided to marry her and found a husband for her. Bona did not want to get married. She wore black clothes and a black head cloth. She slept hiding in the attic. Later, she started working in the city of Plovdiv with 17 other girls from General Nikolaevo. Once, she heard the priest saying that sister Aluisa, Pioress of the Benedictine Sisters, was looking for girls to work in Zarev Brod. Seven young girls left for Zarev Brod. 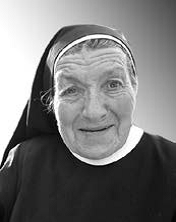 After a conversation with Mother Aluisa, she started working in the monastery until a psychiatric hospital opened in the monastery buildings in 1951. Bona went back home. She helped in the church of General Nikolaevo but kept in contact with Sr.Stanislava. On August 21, 1994, Sr. Quirina and Sr.Barbara came with some believers from Zarev Brod for the ordination of Father Lubomir Venkov and Father Peter Kiosov. Bona was looking forward to this moment. Being asked: “Are you ready to come with us”, she answered: “Yes, I am”. So she left to Zarev Brod with the Sisters and the believers. So she made her first vows on June 06, 1997 at the age of 60. She was given the name Sr. Bernadetta and she remains in the monastery. There, she was growing marigold for the herbal ointment healing eczemas and burns which the monastery is famous for.